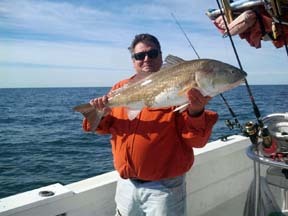 Offshore fishing has slowed a bit with grouper being out of season until April 1, when red grouper will be available. Much of the offshore efforts have been toward amberjack and bottom fishing, with great catches of tasty black sea bass and Florida snapper. 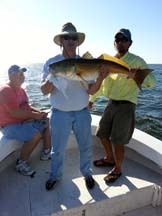 Our boats have been bringing in hundreds of pounds of great tasting filets and some fine amberjack as well. 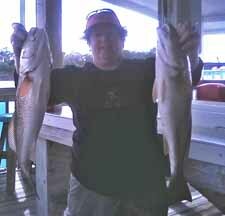 Inshore things have been a little inconsistent but greatly improved over the dark water days of several months ago. After a brief run into the river, the warmer weather (which looks like it will continue for some time) has moved the trout out onto the flats and into creeks. However, on a relatively warm day, fishing in the river to avoid high winds, my buddy Stan Smith caught a five pound trout along a shoreline, so you can never tell. Some of the best catches have been in creeks on low water (accessible pretty much only by airboat or jet drive boats) but we’ve found some nice fish recently by working our way over the shallows to get to the many offshore creek beds and holes. 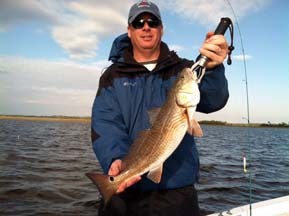 Relatively few redfish have been caught, but some nice fish have been nailed in creeks and around creek mouths, especially inshore of the Pepperfish Keys. Mid-month Capt. Tommy Thompson and I fished hard in some usually excellent areas and found nothing, then worked our way into a large hole a half-mile offshore and caught 30 fish in less than 45 minutes. Although there was a scattering of shorts, most of the fish were slot-sized. In general, as the tide floods later in the day, we will work our way into areas of structure or dark bottom as the water is warmest in these areas; many of these areas are literally dry on some of the negative tides we’ve had recently, the sun warms the bottom, and then when the tide comes in the fish will move the warmer areas. Even with the relatively warm winter we’ve been having, the water temperature is still in the 50’s and they do look for a few degrees warmer if they can find them. Fishing with Doug Barrett near the end of the month, at the flood tide we found five trout over four pounds, and the five pounder seen in the picture, in about 30 minutes before we left them biting. My other pictures show Gainesville Offshore Fishing Club regulars Jay Peacock and Mark Rustemeir with some river trout; a great board of trout limits by Dan Stinchcomb, Ray Mitchell and friend; and Nita Chester with a fine pair of redfish caught near a creek mouth. Because winter fishing is so dependent on water temperatures, especially inshore, trying to figure out this winter is a challenge. Like last winter, it has been virtually spring-like in terms of temperatures. Even when fronts come through, the warming takes place too quickly to get trout in the river in large numbers. However, February usually provides some pretty frigid temperatures. If you’re looking for a fun time with kids, consider a short-range offshore charter to give them tons of action with great eating bottom fish, or if you want to deal with your own bait run to offshore structure or hard bottom in 20 to 25 feet of water. Larger sea bass will be somewhat deeper water, but you’ll get lots of eating fish using cut frozen bait and fish-finder rigs. Inshore, everything is temperature-dependent, but it’s always worth a try around creek mouths this time of year. Because the fish are relatively lethargic, live shrimp and cut bait work well for this kind of fishing if you are the relaxed type and don’t mind sitting in one place for a while. Otherwise, fish deep holes in the flats on low water and rocks and dark bottom in the afternoons when the sun is warming the water…and always be on the lookout for schools of mullet. While trout and reds will certainly eat small mullet, the presence of mullet is a clue to the water temperature; if there are mullet there, it’s likely that the temp is comfortable for predators as well. And looming on the horizon is the sheepshead bite. In fact, there have already been some fine catches of sheepshead on nearshore rockpiles and in the river. 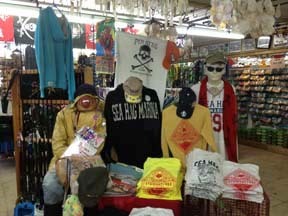 The smaller males are already staging for the spawn, so keep in touch with the Sea Hag to find out about the action. Next month I’ll include a special section on sheepshead fishing…where to find them and how to catch them. So here’s the quandary….it’s January and only two things stand between you and a potentially memorable day offshore: 1) the weather and 2) the National Marine Fisheries Service. Some of my best fishing recollections occurred on winter time fishing trips. The key is finding one of those bluebird days in between the cold fronts that leave Canada on a mission to get to Florida fast. Typically you can expect ice on the deck early in the morning and warmer temps once well offshore. During the winter, the bottom fish are hungry since a lot of the forage species having headed for warmer locales. Frozen, cut and live baits will all cause something to grab your line. The quantity and size of gag grouper caught and released recently gives us hope that this species is recovering well from the red tide that decimated the stock a few years ago. The official term is “overfished” but fishing had nothing to do with the short seasons we have experienced. The sheer quantity and size of red snapper caught and released makes us scratch our heads over NMFS’s unwillingness to give recreational anglers a break. 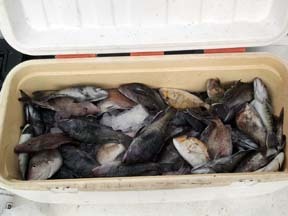 This species has recovered from the damage done by decades of shrimpers killing 80% of the young snappers and discarding as “bycatch”, yet we will have another season measured in days rather than months in 2013. The river was running a chilly 50 degrees on my last trip but the surface water in 80 feet was 67 degrees. Dress in layers and file a float plan, water that chilly is nothing to play around with. 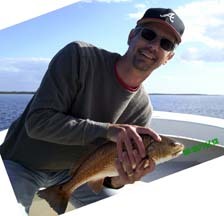 You can expect amberjack, red grouper and the sociable Florida snapper to visit your fish box in January. You can also expect some of the clearest, cleanest air of the year offshore. The cry of the loons that follow the cold fronts is a beautiful and sad lament on how people who never fish get to manage the resource. 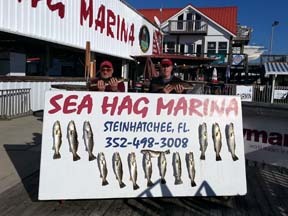 It’s a shame gags and red snapper are closed but when you get the weather, don’t hesitate….go fishing! It’s what we do! 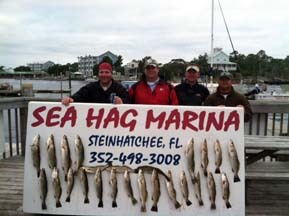 Our cold temperatures make the bite and its location more predictable than the rest of the year, hence the armada of boats anchored from the mouth of the Steinhatchee River to the Sea Hag Marina bringing limits of trout to the dock repeatedly. The fish are enjoying the warmth of the deeper channel waters and are responding to live shrimp and gulp baits slowly jigged on the bottom. Remember presentation is everything. Fish your baits slow. These guys are conserving energy in the cold conditions. If you’re going to catch ’em reel as slow as you possibly can and hold on !!! We will be heading off about 9 miles on blue bird days to structure to catch Florida snapper and black bass. 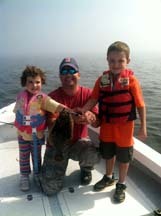 This a great experience for children as we bottom fish with vertical jigs tipped with virtually any kind of bait. This yields nonstop action and a few red grouper to boot. 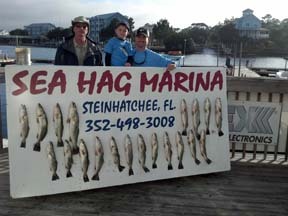 So pretend you live in Minnesota: bundle up in layers and head to the Sea Hag, the friendliest full service marina on Florida’s west coast and let Hooked On Reds reel your new year in right. December was a great month to be on the flats fishing. The weather was better than normal for the most part and the fish very active. Most of my time was spent on the deeper flats with great success. 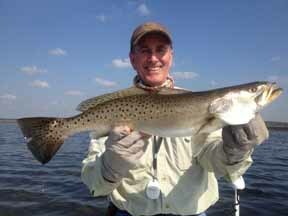 We found lots of keeper size trout with some flounder and sand trout mixed in. 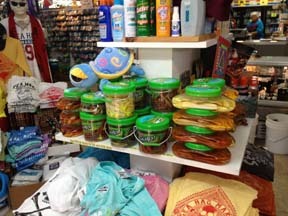 Plastics worked best with white shades producing the bigger fish. 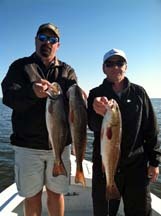 There are still some nice redfish in shallow water around the creeks. January should be a good month also. If the temps continue to drop the trout should start moving into their winter quarters. Have some good days open for this month Thanks and have a great New Year! Depending on how soon ‘winter’ gets here, the water may cool off into the ’50s by the first week of January. If that happens, and we get two or three days of bleak cloudy weather, don’t get depressed. Just head to either the ‘Suicide Hole’ just downstream from the Sea Hag, or to the deep channel near marker #26 and fish for ‘winter trout’. Most of the fish that move into these holes when the weather’s cold are slot-sized, but fat and healthy. If they’re biting, there will be a crowd, so watch your anchoring, casting or drift. I prefer to anchor, make a few casts, and if no luck, continue my drift a few yards and then re-anchor. 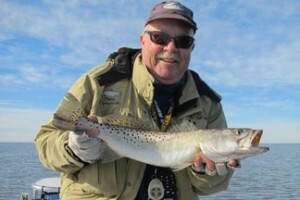 Slow moving, slow sinking lures like MirrOlure TTs or Paul Brown Corkys work well in these places. 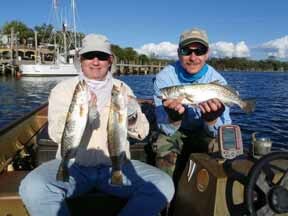 If you’re interested in some more in-depth information about fishing Florida’s Big Bend, take a look at my weekly Fishing4Cast on the Florida Sportsman Magazine Web site at http://www.floridasportsman.com/4cast/bb, the Florida Sportsman Big Bend Action Spotter column in each month’s magazine. 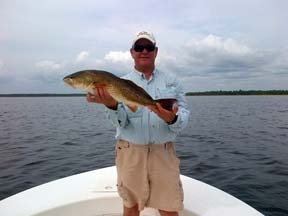 All of the Big Bend fishing 4Casts are now available to to viewed on my editorial website. And starting this month, I’ll be taking over the ‘Sportsman’s Kitchen’ column in Florida Sportsman magazine. I like to fish, but cooking and eating are a close second-place! Winter fishing is a great time to fill a cooler with tasty sea bass, they are so thick you can literally dip them with a net. Pictured here is Jorge and his dad for their once a year reunion to fill Mr Gonzalez’ freezer with a little Florida sunshine when he returns to New York. Amberjack are still around, but require a little coercing with fresh bait. Several trips this month has been our PB&J Special (Pinks Blacks&Jacks), the perfect combo to break up the winter doldrums. 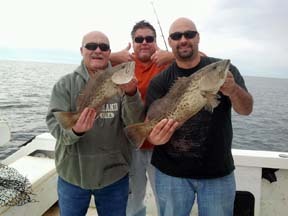 Nice gag grouper might show up for action, take a snap shot and move on to the next location. Big bull redfish are cruising in the deeper water, now that is a thrill you won’t forget, take a picture with your phone and show it off the next day at work! Take advantage of the bluebird days of winter and go fishing! 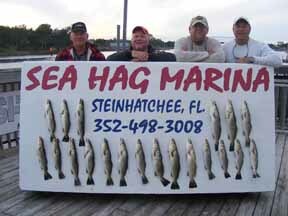 Now thru March 2013 we are running and 8 hour special for $600, up to 6 anglers. 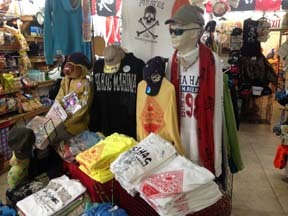 The Sea Hag Marina Ship’s Store has expanded in size and content. 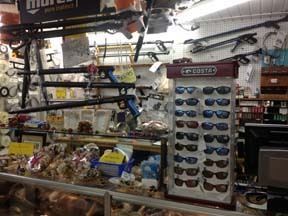 I’ve included some pictures to give you just a glimpse of what you can expect to find. 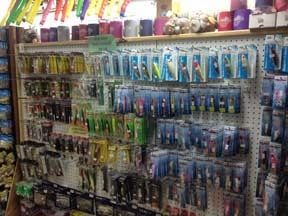 Tons of terminal tackle; artificial lures including both Gulp and DOA baits and a wide selection of plugs (Mirrolure, Rapala, Sebile, Heddon and many others); great customized clothing in all sizes and weights; buffs and gloves for the cold weather; diving and spearfishing supplies as well as tank refills; fishing charts of our area with hotspots noted; a huge choice of rods, reels and combos; braid and monofilament line to update your tackle; and lots of frozen bait, including squid, cigar minnows, threadfins and chum. 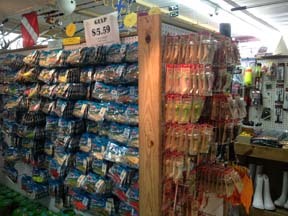 And we also have the finest live bait tanks anywhere, with live shrimp and pinfish ready and waiting for your hook. 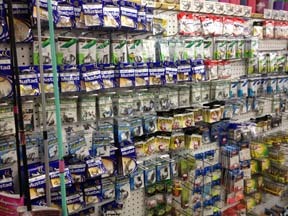 No matter where you fish from, make sure to stop by our store for the largest supply of tackle anywhere in the Big Bend area.